OfficeMax has sent me some supplies to review and share with you - share by giveaway! What's better than that? 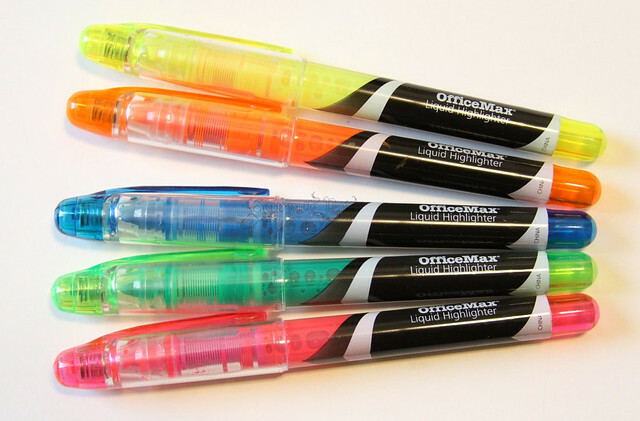 Here we have: OfficeMax Retractable Gel Pens, OfficeMax Pen Style Highlighters and OfficeMax Grip Mechanical Pencils. OfficeMax will ship the prize directly to the winner. Giveaway is all the way at the bottom! Pens featuring new design ballpoint pens in stick and grip styles; and gel pens in grip and retractable grip styles with a new high-quality ink system that delivers a smoother, more reliable ink flow. 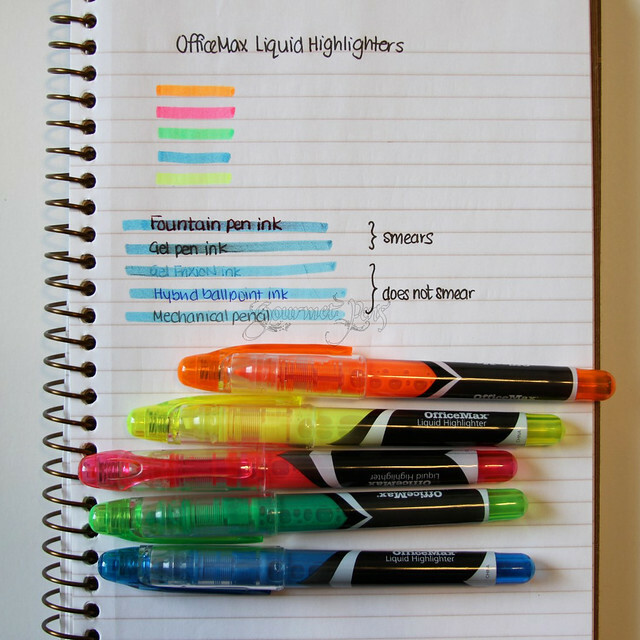 Highlighters including gel, liquid and erasable highlighters, as well as pen-style and desk-style chisel tip highlighters. 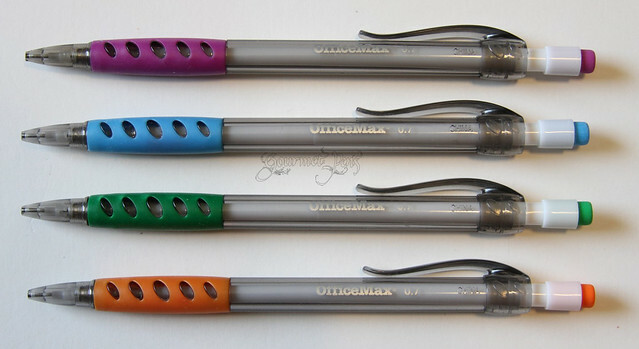 Mechanical Pencils featuring new designs including assorted barrel or grip colors, and top and side advance features. 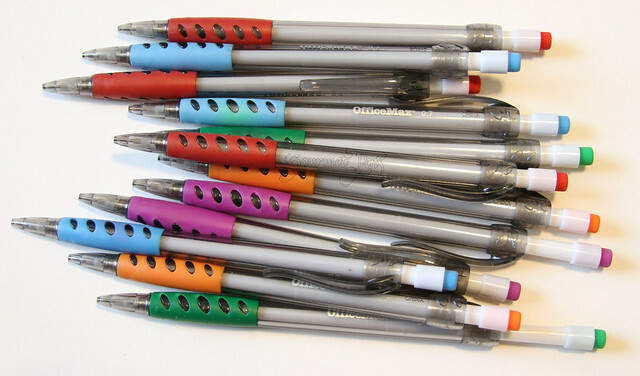 Mechanical pencils are available in 0.5mm and 0.7mm lead sizes. Permanent Markers including new pen-style markers with fine point tips and desk-styles markers with chisel tips. Ah, gel pens. I have very high standards for gel pens. Aesthetically, most gel pens make the cut because there's nothing really wrong with any of them. They all look pretty good. These ones aren't too bad either - they do the job. 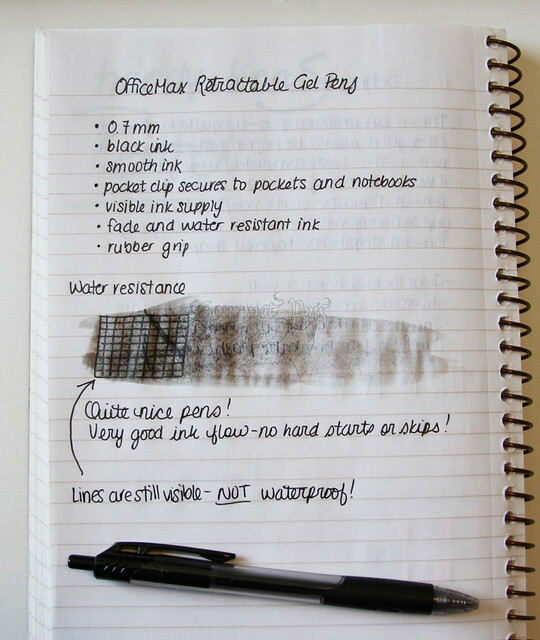 Good, steady ink flow, no hard starts or skipping while writing. The ink is fade and water resistant which is a nice feature, but it is not waterproof. These pens are not refillable but they're a buck apiece. However,that's a lot of plastic into the landfill so I'm disappointed about that. I thought these highlighters were pretty decent. I like the visible ink supply a lot. They smeared a lot with gel inks and fountain pen inks (although with fountain pen ink, that's not surprising). They performed well with FriXion type ink, hybrid ballpoint/ballpoint ink, and pencils. They are pretty. The colours are not extremely vibrant - some people may prefer these colours as they are not particularly blinding. Others may find they are not bright enough. The orange is just right, I think. They're not bad, especially given the low price. I must admit, I was rather attracted to these pencils when I pulled them out of the box. Coloured erasers. Coloured grip. MATCHING. Swoon. Really now. I love things that match. The build quality is okay - I dropped two on my desk from a reasonable height and they popped apart - I had to put them all back together. They didn't break - but all the parts came out from the inside of the pencil and the lead fell out. Not the end of the world, but this could be seriously annoying if it happened to you during an exam. Otherwise, the pencils function just fine and aren't too costly at all. They look decent and are fairly comfortable to write with, providing uniform writing. Don't expect fancy auto-rotating lead though. Disclaimer: I received the writing products in this post from OfficeMax in order to facilitate my review. The items featured in this giveaway are also provided by OfficeMax and will be sent to the winner directly. Opinions expressed in this post are 100% my own. I have not been compensated for this post in any other way. I prefer pencil for things that may need to be changed or moved. 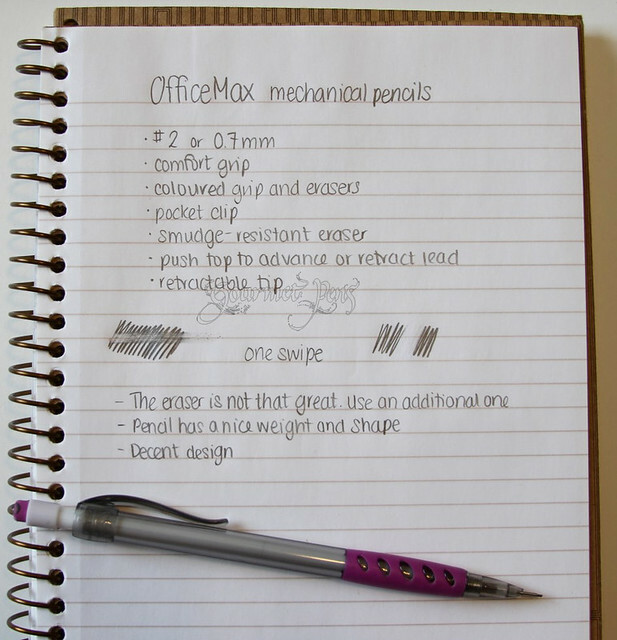 Pens for standing tasks or appointments that are always at a set time or date. I'm a writing implement hussy...I'll write with anything really but I prefer gel pens and pencils (after fountain pens of course)! I love any thing permanent for writing. I only use pencil for more arty type things. I'm more of a pen person: fountain pens, and any kind of purple gel pen. 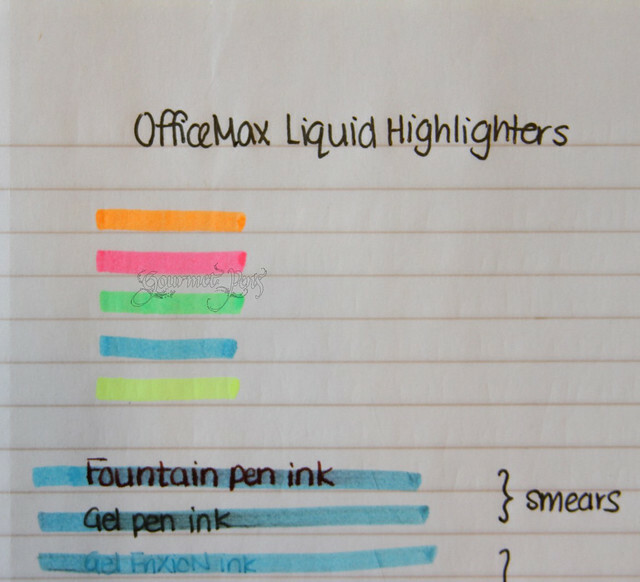 I am in the market for some new highlighters though, so those ones caught my eye. Love the ones where you can see the liquid sloshing around! I like to write with a ballpoint pen. Ball point pens are my kind of thing - any pens will do though, just not pencils! I love a good pen! These look great!